For my interest, I would like to know how many times the Rockies, Angels, and Yankees won on the same day in 2017. Can you tell me how to do this? The Rockies, Angels, and Yankees all won this year on April 4, 22, 28, May 6, 14, 16, 21, and 22. 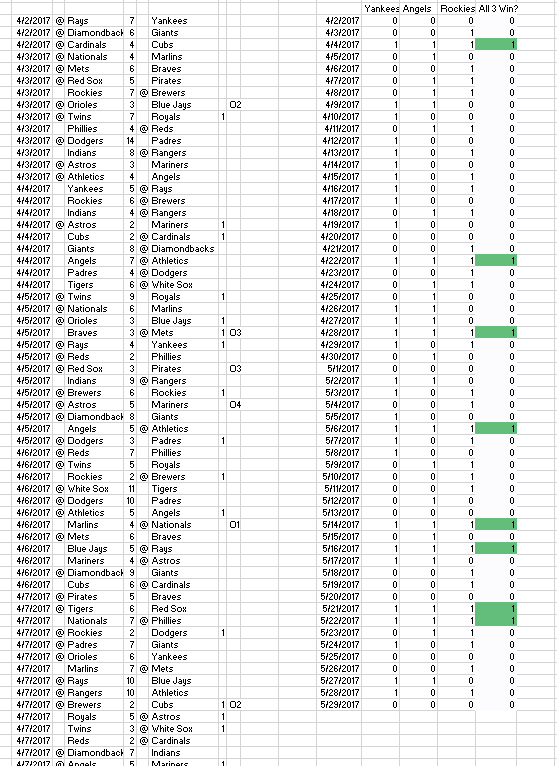 I found this by going to the Data section on Massey Ratings and pulled up the results of all baseball games this year (http://www.masseyratings.com/scores.php?s=294524&sub=14342&all=1&mode=3&format=0). =CountIfs(Column of Dates, Specific Date, Column of Winners, Specific Winner). This is used in the table on the right that returned either 0 or 1. The "All 3 Win?" column just asks if the sum of the row is equal to 3. Why did Game 1 of the 2015 ALDS have a start time that depended on another game? How did Hideki Matsui's “one day” signing affect the Yankees' 40-man roster?